As a devout meat eater, I fall short from the classic vegan persona. I do however, have a liking for vegan desserts as I try to limit my dairy intake. On Sunday Oct. 28, I ventured out to “The Market On South” in the Milk District of Orlando, an ironic location given this restaurant aims to serve O-town’s vegan population. “The Market on South” is a shared plant based market where the restaurants Dixie Dharma and Valhalla Bakery currently reside, alongside other vendors featuring handmade and local goods within the building. Being honest, I am not a super adventurous person when it comes to trying new foods. A safe, carb-loaded treat was a feasible option for me. The chocolate frosted donut from Valkyrie Donuts, who features their locally made donuts in Valhalla Bakery was my test subject for the day. I was in for a literal treat when I purchased my donut. 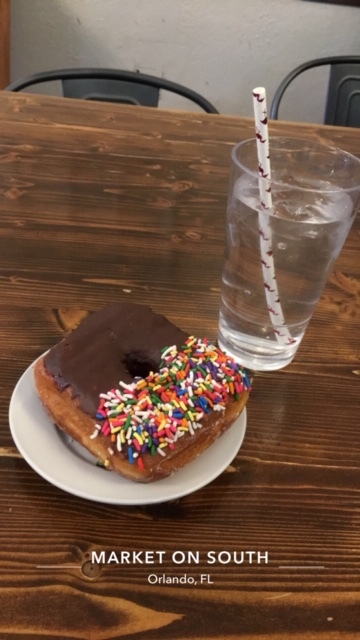 It was a fantastic donut and I am pleased to note that it was dairy free, as hoped. It was larger than a regular donut and had rainbow sprinkles on top of it that made the experience all the more enjoyable. It was just as good as a regular donut with the only difference being the flavor and bitterness of the chocolate frosting. Despite the donut being a little different, I happily ate the whole thing in a matter of minutes. I do not think I have ever consumed a donut I did not enjoy, so thankfully this was added to my list of favorites. I will for sure be returning to the market in hopes to snag another one of these heavenly glutenous treats.